The Wave, Muscat sailed an outstanding final day in Germany, at Act 4 of the Extreme Sailing Series. Three race wins and two podium finishes saw Britain’s Leigh McMillan clinch his third 2015 Act title after four spectacular days of racing in the heart of the city that extended his lead at the top of the overall Series leaderboard. “We do enjoy the pressure of a final day. We got out of the blocks well with a win in race one and that set the tone. It was an amazing performance by the team. Everyone was so fired up this morning and it really showed on the water.” ” said McMillan as he stepped off the boat after winning the day with an average 9.14 points per race* according to the SAP Analytics. But this wasn’t a case of The Wave, Muscat running away with the regatta. Pushing them all the way were Gazprom Team Russia who went into the final day of an outstanding event with fire in their eyes. Helm Phil Robertson’s determination on the dock was unquestionable: “We’re going to go out there like a pack of hungry dogs,” he promised and his team did not disappoint. Duelling with Danish crew SAP Extreme Sailing Team all the way through the last metres of the final double points race to take second overall, their best result to date, the young Russian crew picked up the Land Rover Above and Beyond Award for their effort. The Danes, co-skippered by Jes Gram-Hansen and Rasmus Køstner, were third overall after being pushed down the rankings in the final race of the day by some tactical sailing by McMillan’s crew. This allowed Team Turx and Lino Sonego Team Italia to finish the Act on a high with a first and second place respectively. “I wasn’t particularly comfortable pushing them out of the final race but you just have to look at the overall Series leaderboard, and they are a major threat. We have to take whatever opportunity we can," McMillan explained. But Køstner seemed unfazed: “The Wave, Muscat are afraid of losing points to us, so we take it as a compliment. They are scared of racing us later in the season." New to the Series for 2015 Hamburg, Germany delivered perfect Stadium Racing conditions that saw the fleet of nine elite level Extreme 40s race in everything from 8–30knots in blue skies to rumbling thunderstorms. With crowds of over 44,000 lining the HafenCity waterfront to watch, there was no shortage of drama. 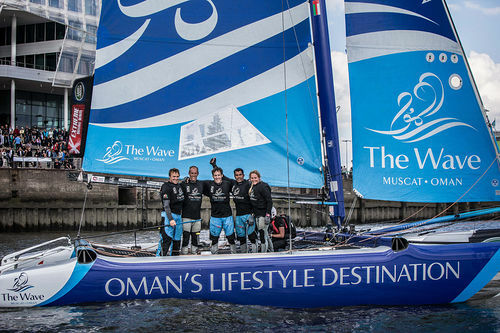 1.The Wave, Muscat (OMA) Leigh McMillan, Sarah Ayton, Pete Greenhalgh, Ed Smyth, Nasser Al Mashari 200 points. 2. Gazprom Team Russia (RUS) Igor Lisovenko, Phil Robertson, Garth Ellingham, Alexander Bozhko, Aleksey Kulakov 190 points. 3. SAP Extreme Sailing Team (DEN) Jes Gram-Hansen, Rasmus Køstner, Hervé Cunningham, Mads Emil Stephensen, Nicolai Sehested 183 points. 4. Red Bull Sailing Team (AUT) Hans-Peter Steinacher, Jason Waterhouse, Jérémy Bachelin, Shaun Mason, Stewart Dodson 182 points. 5. Oman Air (OMA) Stevie Morrison, Nic Asher, Ted Hackney, Ed Powys, Ali Al Balashi 178 points. 6. Team Turx (TUR) Edhem Dirvana, Mitch Booth, Selim Kakış, Diogo Cayolla, Pedro Andrade/Can Bayülken 171 points. 7. Lino Sonego Team Italia (ITA) Lorenzo Bressani, Enrico Zennaro, Stefano Ciampalini, Stefano Rizzi, Manuel Modena 156 points. 8. GAC Pindar (GBR) Seve Jarvin, Adam Minoprio, Marcus Ashley-Jones, James Corrie, James Wierzbowski 134 points. 9. Team Extreme Germany (GER) Paul Kohlhoff, Philip Kasueske, Johann Kohlhoff, Peter Kohlhoff, Max Kohlhoff 78 points. *Score in points: Winner scores 10 points, second scores 9 points etc.